'What shall I do with all my books?' was the question, and the answer, 'Read them,' sobered the questioner. But if you cannot read them, at the very least handle them and, as it were, fondle them. Peer into them. Let them fall open as they will. Read on from the first sentence that turns the eye. Then turn to another. Make a voyage of discovery, taking soundings of uncharted seas. Set them back on their shelves with your own hands. Arrange them on your own plan, so that if you do not know what is in them, you at least know where they are. If they cannot be your friends, let them at any rate be your acquaintances. If they cannot enter the circle of your life, do not deny them at least a nod of recognition. I especially love the idea: "Arrange them with your own plan...". Is your to-read pile arranged in some personal order? Mine is. It helps me to know where they are, if not what is in them. Churchill was a smart guy. How thrilling to have something in common with him. I take the same attitude toward iPhone apps. I love scanning over what is available, following up tips from friends or magazine writers, tracing thoughts through to possible apps, and I love downloading them. I love the idea of having research tools available in my pocket when I might need them. I find it all to be a dream-library of potential. It holds all your information, and has a desktop and mobile version, and you can also access your information from anywhere via the Internet. It can store lists and text, but also photos and voice and best of all, if you have it on your desktop, under any print menu you can choose the option "save as pdf to Evernote". The pdf document will be OCR-searchable in Evernote, so you can find info in long documents by words that appear in them. Fantastically useful. (And, in fact, I will paste the Churchill quotation above into my "happiness" document on Evernote, so I can read it reassuringly to any other person who worries about buying books faster than they can be read.) 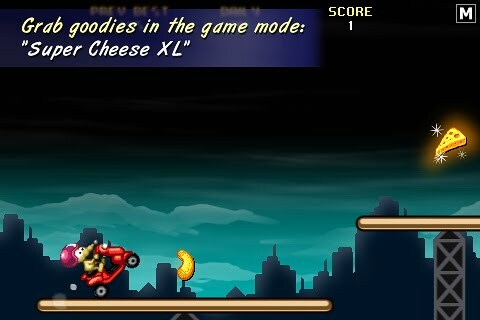 PS Thanks K.
#2 - My favourite game - Rat on a Scooter XL (Donut Games) - The best $0.99 you will ever spend. It's a great way to kill a few minutes in a waiting room or a parked car. As addictive as they say it is. And I am not a gamer (in case you didn't know that). PS Thanks J. Totally worth the price of the sensor in the shoe - links to music, history of runs or walks, gives distance and time elapsed, and calories burned AND Lance Armstrong calls you up to tell you when you've completed your personal best mile ever! Sort of. Possibly better on an iPad, but still, apart from the many free-content readers that help you pass time in an airport lounge while carrying only your phone, the idea of getting the content you want to read right now while you are waiting in an airport lounge while carrying only your phone is too compelling to resist. Searches through apps on a number of categories, in a slightly different way than the app store, but the best is it tells you apps that are on sale, for free or at a discount, and that lets you try things that you would never search for, or know about, or want to pay for to find out about, and it can lead you to other things that you then know about to search for, so it becomes like following your nose through a library. LibraryThing Mobile - Free, just like on-line - I can look up my library from a bookstore to see if I already own a book I find interesting. It happens a lot. Also good for giving an exact title and author recommendation to someone no matter where you are. Also good for tracking down a title or author you are trying to think of no matter where you are. App Box Pro - $0.99 - full of little useful utilities that you would otherwise be downloading separately, and paying for separately, and cluttering up your menu with separately. Some that I have used on the fly: tip calculator, currency converter, level and ruler. They have just added a password keeper and I see it has a translator too, although I like specialty programs for that. Yorkdale - free and I refer to it weekly. No more need be said. 24/7 - free - language tutors and my kids like them too. Canon wireless printer app! Yes! Just bought one of the printers. Can't wait to print wirelessly from my iPhone and iPad. Birding version of Shazam. Caveat: I have never yet managed to get Shazam to identify a song, so it might be the same bust for bird song. Plus I am been trying other ways around it - recording birds I hear to my phone - usually too far away to be captured by the mike. Now I have loaded my birding identification Cd's into my phone, so maybe I can go to my best guess in iTunes while in the field and see if it matches. Haven't had a a chance to test it yet. Still trying to decide on which (expensive) birding app to buy. Which provider? How big an area? All in one or multiple for different areas? I have more than 10 pages of apps (that's a little over 150) but you don't need to know everything I have. Find your own. Make your own list. Send it to me. Angry Birds - $0.99 - also a great and addictive game - right now the number one paid app at the store - many new addicts in my house alone. Bloomberg - free - for business news plus stock ticker etc. Not so much my life, but one of those potential research tools I love to have - what is the price of gold today? how much did the NASDAQ go up? what is the prime minister of japan saying about their dangerous debt to GDP ratio? Netnewswire - free - delivers RSS feeds to your mobile. I downloaded it, but I try not to subscribe to too much, as I can't keep up.